Garage Door Has A Mind Of It's Own? Is your garage door reliable? Or does it squeak, rattle and clunk its way down to the ground, making you wonder how much longer it’s going to last? You need to be sure that when you get your car into or out of your garage it won’t be a struggle to open the door, so it’s essential to keep your door in good working condition. We’re proud to offer a wide range of repair services, from maintenance and repairs to replacement and installation. We can provide solutions for all the problems homeowners can face. Garage doors are built to last and are hard at work all year round. The constant strain of hauling a heavy door up and down every day eventually causes the mechanisms to wear out. What starts as a persistent squeaking can quickly develop into a much more serious problem, and it’s important not to ignore these warning signs. Organizing regular maintenance for your system is vital, as it can make it live up to its full potential. Our technicians at Garage Door Repair Portland are highly experienced, and can recognize the underlying faults that produce various common door problems, and then find the best course of action for fixing these issues. Whether it’s a squeaky roller, a non-responsive remote or an inoperable motor, our employees can quickly diagnose the issue that’s affecting your garage door and quickly carry out the necessary repairs. 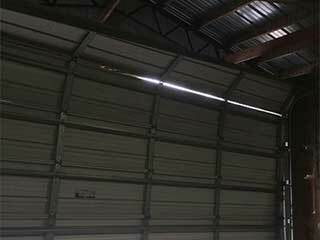 If a garage door has suffered heavy damage from fire, water or electricity, it might be necessary to replace the unit in its entirety. In such a case, our engineers are fully capable, and certainly more than willing to install your new garage door after they'll consult and advise you on which model will best suit your needs. Call Garage Door Repair Portland Today! We're always ready to help our customers deal with any related issue they may be experiencing.